A computer graphic based on sketches created from the description of mobile bio labs from Iraqi informant, Curveball. 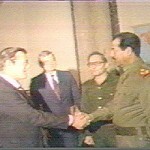 After the 911 attacks the hawks in the Bush Whitehouse pushed for the invasion and overthrow of the Saddam regime. In order to build international support to mount an invasion of Iraq the Secretary of State in the Bush administration, General Colin Luther Powell, gave a presentation on the status of Iraq’s Weapons of Mass Destruction (WMDs). 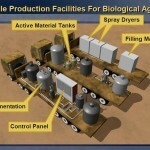 The speech given at a plenary session of the United Nations Security Council on February 5, 2003 was presented with Images of Iraq’s supposed WMD program including this image of Iraqi Mobile Production Facilities for biological weapons. 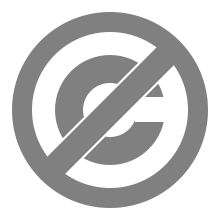 The image was used by media around the world making it a house hold image. The reports of mobile biological weapons facilities emerged from supposed defectors of the Iraqi Weapons of Mass Destruction program. 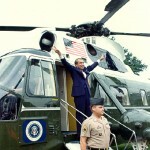 The whitehouse cited four sources that claimed the mobile units existed. The first reports came from an Iraqi defector, given the codename “curveball”, who came to Germany claiming assulym because he was accused by the Iraqi government of stealing money. In Nov, 1999 Curveball changed his story claiming, to German intelligence agents, that he designed laboratory equipment to convert trucks into biological weapons laboratories. This intelligence was passed to the US who at that time were looking for evidence of mobile facilities. 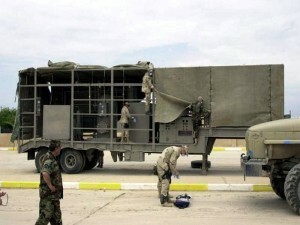 Even though British intelligence and other Iraqi defectors found much of Curveball’s testimony to be false, divisions of the CIA saw his accounts of the facilities supporting descriptions of mobile labs they found on the internet and even though foreign intelligence agencies and even other divisions of the CIA particularly the European division maintained that Curveball’s testimony was false, the account of the mobile weapon labs was still used in Powell’s speech. In Feb of 2002 the Iraqi National Congress (INC) provides Mohammad Harith who claims that on behalf of the Iraqi government he had purchased seven Renault refrigerated trucks so that they could be converted into mobile biological weapons laboratories. By May 2002 a “fabricator notice” is issued to the intelligence community concerning Harith’s testimony after the Defense Intelligence Agency (DIA) determined that the intelligence he provided was false and he been “coached by [the] Iraqi National Congress.” Even though the “fabricator notice” was sent out Mohammad Harith’s and Curveball’s discredited accounts of mobile labs were used in Powell’s speech. The third source that was quoted by Powell as credible testified in June 2001 that Iraq had mobile weapons labs. However, this source later recanted in October of 2003 directly contradicting his earlier testimony. The fourth source cited by Powell remains classified. Let me take you inside that intelligence file and share with you what we know from eyewitness accounts. We have first-hand descriptions of biological weapons factories on wheels and on rails. Some of the other slides used to show the Iraqi mobile production facilities used to make biological agents. Although Iraq’s mobile production program began in the mid-1990s, UN inspectors at the time only had vague hints of such programs. Confirmation came later, in the year 2000. The source was an eyewitness, an Iraqi chemical engineer who supervised one of these facilities. He actually was present during biological agent production runs. He was also at the site when an accident occurred in 1998. 12 technicians died from exposure to biological agents. He reported that when UNSCOM was in country and inspecting, the biological weapons agent production always began on Thursdays at midnight, because Iraq thought UNSCOM would not inspect on the Muslim holy day, Thursday night through Friday. He added that this was important because the units could not be broken down in the middle of a production run, which had to be completed by Friday evening before the inspectors might arrive again. This defector is currently hiding in another country with the certain knowledge that Saddam Hussein will kill him if he finds him. His eyewitness account of these mobile production facilities has been corroborated by other sources. A second source. 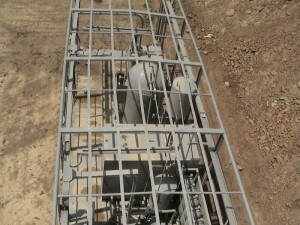 An Iraqi civil engineer in a position to know the details of the program confirmed the existence of transportable facilities moving on trailers. A third source, also in a position to know, reported in summer, 2002, that Iraq had manufactured mobile production systems mounted on road-trailer units and on rail cars. Finally, a fourth source. An Iraqi major who defected confirmed that Iraq has mobile biological research laboratories in addition to the production facilities I mentioned earlier. We have diagrammed what our sources reported about these mobile facilities. Here you see both truck and rail-car mounted mobile factories. The description our sources gave us of the technical features required by such facilities is highly detailed and extremely accurate. As these drawings, based on their description show, we know what the fermenters look like. We know what the tanks, pumps, compressors and other parts look like. We know how they fit together, we know how they work, and we know a great deal about the platforms on which they are mounted. As shown in this diagram, these factories can be concealed easily — either by moving ordinary looking trucks and rail-cars along Iraq’s thousands of miles of highway or track or by parking them in a garage or a warehouse or somewhere in Iraq’s extensive system of underground tunnels and bunkers. We know that Iraq has at least seven of these mobile, biological agent factories. The truck-mounted ones have at least two or three trucks each. 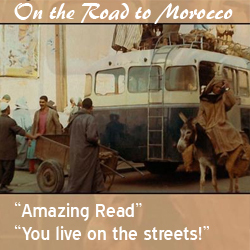 That means that the mobile production facilities are very few — perhaps 18 trucks that we know of. There may be more. But perhaps 18 that we know of. Just imagine trying to find 18 trucks among the thousands and thousands of trucks that travel the roads of Iraq every single day. It took the inspectors four years to find out that Iraq was making biological agents. How long do you think it will take the inspectors to find even one of these 18 trucks without Iraq coming forward as they are supposed to with the information about these kinds of capabilities. Ladies and gentlemen, these are sophisticated facilities. For example, they can produce anthrax and botulism toxin. In fact, they can produce enough dry, biological agent in a single month to kill thousands upon thousands of people. A dry agent of this type is the most lethal form for human beings. There was a critical absence of instrumentation for process monitoring and control of the process. The positioning of the inlets and outlets on the reactor would make even the most basic functions (such as filling completely, emptying completely, and purging completely the vessel) either impractical or impossible to perform. The lack of the ports required to introduce reagents would exacerbate this problem. These aspects of the design alone would render fermentation almost impossible to control. The low-pressure air storage system capacity would be inadequate to provide the volume of compressed air required to operate the fermentation process over a complete aerobic production cycle. In addition, it would not be practical to charge and use the existing compressed gas storage with nitrogen or carbon dioxide for anaerobic fermentation. Similarly, the collection system for effluent gas would be wholly inadequate to deal with the volume of effluent gas produced during a complete production cycle. Harvesting any product would be difficult and dangerous. The trucks were in fact what the Iraqi’s claimed them to be for, the production of hydrogen to fill balloons to determine target adjustments for long range artillery targets. The original technology had been in fact sold to Saddam by a British company, Marconi Command & Control which sold the Iraqi army the Artillery Meteorological System, in 1987. Even the day before the speech Powell and his long time deputy Larry Wilkerson had doubts on the mobile bio labs. Larry Wilkerson remembers that, “Powell and I were both suspicious because there were no pictures of the mobile labs [but the CIA] said: ‘This is it, Mr. Secretary. You can’t doubt this one,'” Powell was later asked to resign and did, announcing his resignation as Secretary of State on Monday, November 15, 2004. 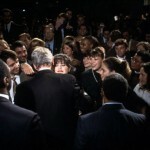 In 2005 he told Barbara Walters that he feels, “terrible” about giving the speech and when asked if it tarnished his reputation, Powell said, “Of course it will. It’s a blot. I’m the one who presented it on behalf of the United States to the world, and [it] will always be a part of my record. It was painful. 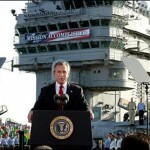 It’s painful now.” On Sept 13, 2004 he told the Senate Governmental Affairs Committee that the intelligence that made up the speech he gave to the UN in 2003 was flawed and that it was, “unlikely that we will find any stockpiles” of WMDs in Iraq.